Welcome to Friends Driving School. My name is Peter Leonard and I have been a DVSA Approved Driving Instructor since 2000; I am also a member of the Professional Driving Schools Association of Taunton. Over the course of my years teaching I have achieved a consistently high pass rate and have built up a good reputation for providing quality tuition in and around Taunton & Bridgwater, Somerset. With over 95% of my pupils coming to me through word of mouth. Learning to drive involves mastering many skills, & following the recent changes to the practical driving test there are even more to overcome. These include having the ability to follow a sat nav safely & accurately, & being asked by the examiner to perform such tasks as turning on the car's lights, wipers or demisters, or opening a car window, all whilst on the move. There is however nothing in the new test that cannot be mastered. I enjoy teaching people to drive as I know how important it can be to them, but it's not only about getting pupils through their test, it's also about making them safe and confident drivers. The area that I teach in is Taunton, Bridgwater and surrounding areas. If you would like to discuss with me your requirements further, then please do not hesitate to contact me. 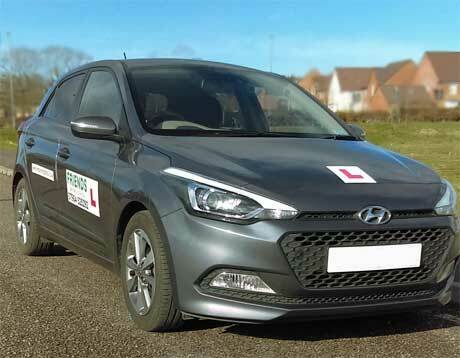 You will learn to drive in our top spec i20 premium model Hyundai with dual controls. It is an easy car to drive and manoeuvre making it an ideal car for beginners. Being a compact car it is easy to drive into those tight parking spaces.